Mowing can control spring weeds, proper fertilization and other tasks to do in your pre-spring landscape. Even though the winter was warm this year, the trees still lost their leaves as usual, and our most lawns went dormant as a result of a couple of hard freezes. With the winter coming to an end and temperatures warming quickly, we’re all feeling that springtime excitement and ready to see some new green emerge! About this time each year, weeds will begin to grow quickly. Mowing in February and early March will cut off their flower heads before they bloom and spread more seed, greatly reducing your population of spring weeds. As a bonus, the clippings will quickly compost into the soil when left on the lawn, adding nutrients to the soil. Mowing now also allows more light to reach the soil, warming up microbes and alerting them to get to work improving soil and also warming roots, prompting them to grow. Mow weeds before they spread! 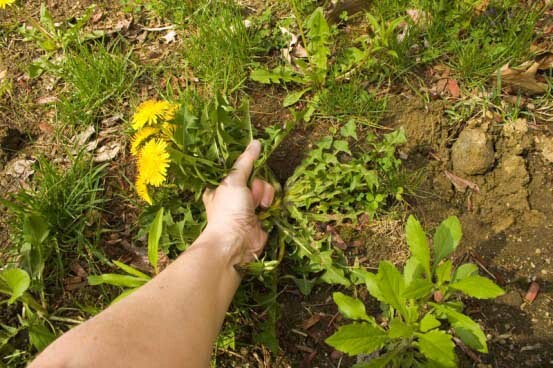 How can you control your weeds before they grow out of control? And why are a few weeds in your organic lawn not such a bad thing? Read more HERE. We know that adding quick-release synthetic nitrogen fertilizer to the soil can make plants grow and turn a deep, beautiful green. It’s tempting to think that if we add fertilizer to the lawn in late winter, it will jumpstart the grass to green up and take off. Unfortunately, this is not the case. There are several factors that trigger your grass to begin sprouting new growth. Day length, total sun exposure, and soil temperature are the main contributors to the breaking dormancy in your lawn. Putting fertilizer down too early does not alone stimulate new spring growth, and therefore results in a wasted money and resources. When you fertilize too early, all you’re doing is fertilizing the cool-season weeds! You’ll still want to mow the lawn a few more times before your first heavy feed. The right time to add a strong fertilizer is in April when the lawn is completely green and in need of regular mowings. At this point, grass is ready for a boost that will sustain it through the rest of the season. Instead of an unnatural blast of synthetic fertilizer, our year-round Soil Building treatments provides steady stimulation to the microbes and fungal networks that improve the soil in both texture and nutrient quality and quantity, growing healthy roots and vigorous plants. Are you a plan member? We’ll be applying an organic dry fertilizer beginning in April to give plants a boost prior to summer heat and drought.